vrom Bendavid-Val was working as an environmental consultant in Poland in 1997 when he decided to cross the Ukrainian border and visit the place his father came from, the town of Trochenbrod. Finding nothing there, he was determined to uncover the history and spirit of the vanished town. Avrom continues to this day to research, write and make films about the town, and serve as the anchor for the American community of Trochenbrod descendants. Avrom Bendavid-Val lives in Washington, D.C. 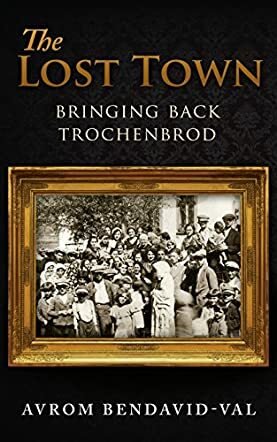 The Lost Town: Bringing Back Trochenbrod by Avrom Bendavid-Val is the true story of a little town that went unnoticed. Trochenbrod was actually quite a big place, home to more than 5000 Jews. So how come it was never noticed? The town operated from within a forest in the Northwest of the Ukraine. It was a busy, thriving town and, although it was seen as the city for the Polish and the Ukrainian villages that surrounded it, not many people knew about it. By the end of the Holocaust, Trochenbrod had disappeared, along with all its inhabitants. There was nothing left for anyone to see of a town that had survived for more than 130 years, except for an oddity in a forest clearing – a double row of bushes and trees. Avrom Bendavid-Val takes us on a magical adventure to uncover the lost town of Trochenbrod, the town where his father was born and raised. I have always been fascinated, if that is the right word, by the stories that came out of the Holocaust and the people that were lost to it. The Lost Town by Avrom Bendavid-Val is another to add to my collection. The fact that it is written in such an easy-going style and aimed at children is fantastic – I believe that children should not be shielded from history, but rather should learn all they can about it. After all, history is what makes them who they are. Avrom includes the memories of three survivors, their stories of their escape and what they went through, as well as the answer he found in his search for the truth. This gives all of us, children and adults alike, real and honest insight into a small part of the Holocaust and its effect - not just on individuals, but on entire races, entire countries. This is an amazing story and I really feel that there should be more history written in this vein.